When interior designer Rashi Tulshyan designed her own apartment - her first home with husband Rahul Daswani - she wanted to create a "modern luxe" feel, but not necessarily by going the whole hog on high-end furnishings. "We kept the motto of 'high-low' for our design from the beginning, which meant we wanted to splurge on key items and save on others," says the 27-year-old, who set up her own interior design company, Home Philosophy, this year. 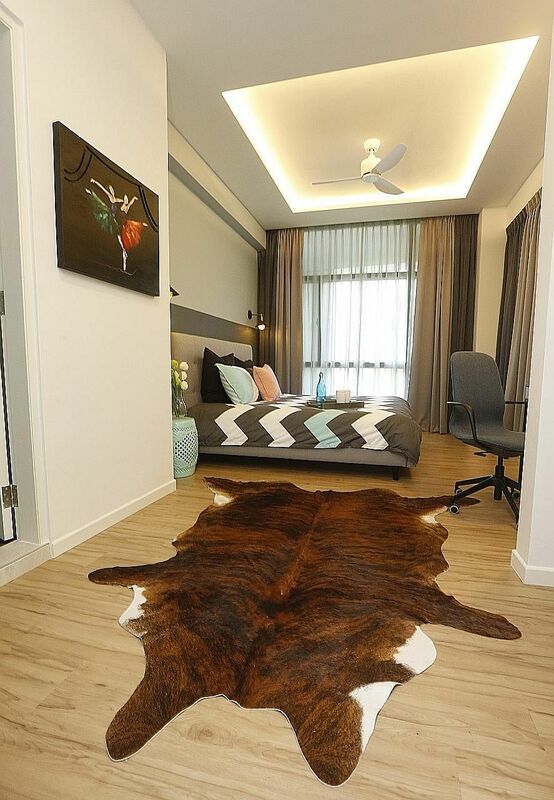 When the couple bought the 16-year-old condominium apartment in Havelock Road last year, the floors, kitchen and bathrooms were rundown. "It was very difficult for me to conceive what this place could be like," says Mr Daswani, 34, a senior manager at the Ministry of Home Affairs. Ms Tulshyan recalls: "He said, 'There's no way we're going to spend our money buying this.' But I said, 'Hold on - I can visualise it. Let me work my magic.' My home ended up being the first real-life case study, where my husband was sort of coerced into being a client." They spent $100,000 on renovations, including removing some walls to create larger spaces in the kitchen and bedroom; and just under $40,000 on furnishings for the 1,450 sq ft apartment, putting their "high-low" philosophy into practice. "The biggest splurge was on the marble floors," she says. The cost, including that of hacking the old, reddish granite tiles, was $20,000. "It was a big cost, but there's something about the natural grains in marble that a tile can never replicate. Also, it's cool on your feet and it gives a luxe feel." Other splurges include a hand-woven Kashmiri rug made of wool and bamboo silk, bought for just under $5,000 from Hassan Carpets. At the other end of the spectrum, the large kitchen, which Ms Tulshyan is proudest of, comprises Ikea cabinetry and cost $8,000. "When I was looking at working with local carpenters, the cost was close to double," she says. "There is this perception that Ikea is for college students... but its quality is really good. It uses wrap-around foil laminates for its cabinets and the machinery that's used to do the wrapping is very expensive. A lot of local carpentry just stick the materials together." Adding a marble tile backsplash and black granite sinks kept the look polished. Ikea cabinetry is also used in other parts of the apartment, such as for the television console, a shoe cupboard and in a walk-in wardrobe, the last of which would have cost 40 per cent more had they opted for built-in carpentry, Ms Tulshyan says. The guest bedroom, which has a Scandinavian theme, was put together for an affordable $5,000 using furniture from Ikea and Castlery. It has a dual-tone painted wall and curtains, as well as Oriental antique accents in the form of mint-green $150 stools used as side tables. The "high-low" design philosophy fits perfectly with their lifestyle, Ms Tulshyan says. "It's something we see happening, whether it's fashion - you wear your Zara and H&M, accented with great shoes or a really nice bag - or food - you splurge on a great meal once a month and eat at the hawker centre the rest of the time. "This concept is something I think millennials and young people are really happy with."